The Scottish Land Use Strategy (2011) promotes integrated and multifunctional land use. To test its application at a regional level, two pilot projects were initiated. The aim of the pilots was to “consider existing and future land uses in a collective and integrated way with a view to optimising the use of the land, and to establish a mechanism to prioritise or guide decisions about possible competing or conflicting uses”. 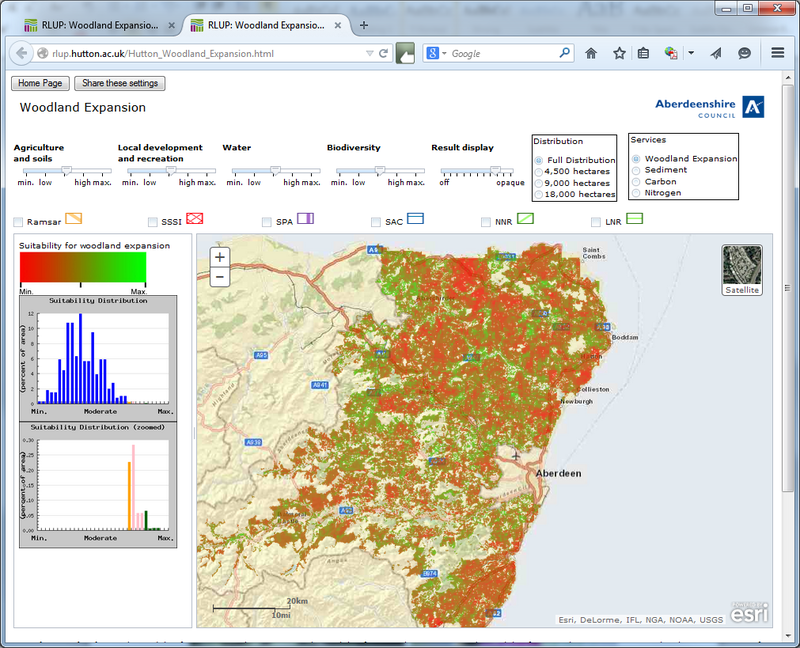 As part of the activities in the Aberdeenshire pilot we set out to develop a spatial mapping tool that could provide support to strategic deliberations over where to focus decisions on land use change that could deliver multiple benefits. We developed an interactive web-based mapping tool that allows users to explore the consequences of following different policy priorities on land use change and ecosystem service delivery using native woodland expansion as a lens. The tool is freely available at http://rlup.hutton.ac.uk/ and allows the user to visualise, as maps, connections between land, water, access, carbon and biodiversity issues. The tool prompts users to think about potential change and its implications by visualising, in a relatively simple way, large amounts of data and complex calculations that link land, water, access, carbon and biodiversity issues and thus provided a mechanism for identifying trade-offs and the delivery of multiple benefits. The results show that a) if Aberdeenshire took an area-based proportional share of the woodland expansion targets for Scotland, this would only involve a relatively small area (Fig 1a) indicating the potential value of the tool in illustrating regional targets and b) even with this land use change, there is a decline in ecosystem service delivery. This decline in service delivery is mainly attributable to the potential expansion of prime land under climate change and the associated pressures on soil and water if expansion of this land use was realised. However, the delivery of services and benefits through land use change should not be considered in isolation of the potential improvements that can be realised through changes in management of existing land uses. The regional land use pilot provided a forum, that otherwise did not exist, for engaging a wide range of stakeholders in discussion over land use change and the delivery of a range of ecosystem services. The stakeholder group could see the benefits from, and supported a more holistic approach to rural land use planning that the tool facilitated although limitations in the data were recognised (see http://www.hutton.ac.uk/research/workshops). The tool takes into account the constraints and opportunities derived from policy goals and the potential land capability under a medium prediction for climate change for 2050. To do this, each land parcel (pixel) is scored against 22 criteria relating to policy goals including biodiversity, carbon, water management, safeguarding food production and recreation. The tool allows the user to explore how changing the weighting of the different criteria leads to different configurations of land use change using woodland expansion as a lens (Fig 2). The consequences of these different configurations on sediment retention, nutrient retention and carbon storage can also be viewed. Using the criteria, the map based predictions rank areas according to their suitability for a proposed change such as woodland expansion taking into account how it could provide other benefits such as recreation opportunities or reduce problems such as water quality issues. For example, users can visualise the most suitable areas for broadleaved woodland expansion if water management was prioritised, as well as the consequences for sediment and nutrient export (Fig 1b). This work relied on integrating skills in the areas of land use change, spatial modelling and developing web based applications as well as stakeholder engagement and participatory techniques. We aim to develop the approach to explore wider land use change options, building on the current woodland and prime land expansion focus. For example, we plan to develop the tool to help explore the effectiveness of schemes such as the SRDP Environmental Cooperation Action Fund to deliver environmental benefits at the landscape scale. It demonstrates how a strategic approach could help planners to target support to areas where land use change could deliver multiple benefits. However, due to limitations in the resolution of the available data, implementing the options for land use change suggested by the tool still requires a local-level ground-truthing evaluation. These findings have been used by Aberdeenshire Council to provide their overall lessons learnt regarding the pilot to Scottish Government. The final report 1 was submitted to Scottish Government at the end of March 2015. The material was also presented to stakeholders at various Land Use Strategy events in May and June 2015. In turn, the Scottish Government is using the results from the Aberdeenshire and Borders Pilots to help develop the Land Use Strategy 2016-2021 (see http://www.gov.scot/Topics/Environment/Countryside/Landusestrategy for more information). The process of developing the tool has shown the benefits of such a voluntary approach in bringing strategic decision makers together at a regional scale. Ultimately, if the tool and the wider lessons from the pilot are to have a legacy in developing a more integrated approach to land use change then the Land Use Strategy would benefit from a more statutory basis in planning.